Throughout the country, telephone and electric cooperatives have found ways to bring affordable, high-speed Internet service to rural residents. This resource page is a one-stop shop for facts and figures on cooperatives and thier role in offering high-speed Internet service. From Alabama to Oregon, cooperatives have taken on the challenge of bringing fast, affordable, reliable, connectivity to rural America. This page highlights model projects and discusses what state governments can do to support cooperatives' efforts to connect rural America. We feature electric cooperative fiber optic projects, cooperatives offering gigabit (1,000 Mbps) service, and the first Internet cooperative - RS Fiber in Minnesota. As of July 2017, almost 90 cooperatives offer gigabit service to their members, and more than 50 electric cooperatives have programs or projects to improve connectivity. Check out all the information, including several of our podcasts and videos, on our cooperatives resource page. Suggestions, comments, or questions? Drop H. Trostle an email at htrostle@ilsr.org. Image of the barn courtesy of backituptech on pixaby. This is the central hub for ILSR’s research on Internet access around the Appalachian United States. We have compiled federal statistics on broadband availability and federal subsidies for large Internet Service Providers. We've created detailed maps of 150 counties in Kentucky, Southeast Ohio, and northern West Virginia. We've also created Rural Toolkits for Kentucky, Southeast Ohio, and northern West Virginia. These toolkits offer a big picture look at connectivity on a regional and statewide level. They also provide action steps for folks to learn more and get involved. Internet access: if you can get online, check email, and browse the web. Broadband: the Federal Communications Commission (FCC) currently defines this as speed of 25 Mbps download and 3 Mbps upload. Fiber-to-the-Home (FTTH): a high-speed fiber-optic connection directly to the home. This type of technology can support speeds of more than 1,000 Megabit-per-second (Mbps). Appalachia can get better Internet service, but the big companies aren’t going to do it. Cooperatives and small towns are stepping up and delivering world-class Internet service. This information covers the entirety of the state – all 120 counties. Rural Toolkit: This toolkit provides the basics of how to get started. 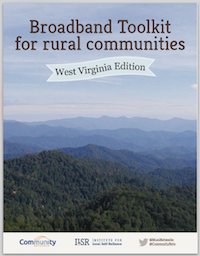 From what is broadband to the details of federal funding, this toolkit has got you covered. At the back, it includes a statewide fact sheet, which is also available separately. Statewide Fact Sheet: Did you know that three Internet Service Providers get more than $327 million to spend on rural Kentucky? Did you know that they aren’t required to build high-speed networks offering broadband? Tri-County Electric plans to soon begin services to Trousdale County, the smallest county in Tennessee. Many of the county's 8,000 residents' choice is limited to Comcast and AT&T, and Tri-County Electric's Vice-President and General Manager Paul Thompson noted that people in the county often only subscribe to about 6 Mbps download and 1 Mbps upload. With a steady membership base of 50,000 spread across two states and a close relationship with the county, the electric co-op is in a good position to move forward with the Fiber-to-the-Home (FTTH) project. The cooperative intends to offer an affordable base package that provides faster, more reliable connectivity than what the incumbents are willing to offer the rural communities. Lac qui Parle County in western Minnesota has some of the best connectivity in the state. As part of the county’s efforts to get the word out about opportunities in the region, their new Facebook video highlights access to great Internet access and hopes to draw more citizens to the region. "Come for the Jobs. Stay for the Lifestyle"
Pam Ellison, Economic Development Director for the County, describes the network that is available across the county to businesses and residents. High-quality Internet access is a way to retain businesses, attract new endeavors, and entice people to fill new positions. Back in 2009, the county began working with Farmers Mutual Telephone Cooperative to find a way to improve Internet access. Through their collaboration, the two entities received a 2010 American Recovery and Reinvestment Act (ARRA) to deploy Fiber-to-the-Home (FTTH) connectivity and replace antiquated dial-up. At the time, about 52 percent of premises were still using their telephones to connect to the Internet. Lac qui Parle had approached incumbent providers, but none were interested in upgrading in the sparsely populated region. Farmers Mutual Telephone Cooperative had deployed in other communities in western Minnesota and had the experience required in such a rural area. The project’s $9.6 million ARRA combined grant and loan allowed the project to be completed by the summer of 2014. Read more details about the network and the story in Lac qui Parle County in our 2014 report, All Hands on Deck: Minnesota Local Government Models for Expanding Fiber Internet Access. Journalist Jill Nolin recently dove into the details of electric cooperatives and Internet service in an article for the Thomasville Times-Enterprise in Georgia. Rural electric co-ops offer an avenue for robust rural connectivity that is in keeping with the long-standing rural tradition of self-reliance. The article features interviews with several local electric cooperatives (EMCs) for their perspective on providing Internet service. Nolin spoke with Blue Ridge Mountain EMC, an electric cooperative that has been offering Internet service for almost ten years. Nolin describes how the electric cooperatives are currently asking for the law to be clearly spelled out in the state of Georgia. June will be an exciting month for people living in Brownton, Buffalo Lake, Fairfax, and Stewart in Minnesota. RS Fiber Cooperative will begin construction so those premises can connect to the Fiber-to-the-Home (FTTH) network now serving six other communities in the central Minnesota region. This stage of the buildout should bring another 500 subscribers on to the network by the end of the year; the network already serves 1,100 premises. Customers who take FTTH service now can sign up for voice, video, and Internet access up to 1 Gigabit per second (1,000 Mbps). Addresses that are outside the fiber connection service area have been able to obtain service from the cooperative via its fixed wireless RS Air service. The RS Fiber Cooperative story began in Sibley and Renville Counties as a regional municipal effort but when Sibley County pulled out, the project had to restructure their plan and design a new strategy. Rather than leave the rural farms behind, the participants decided to form a broadband cooperative to serve as many premises as possible. Local farms - some of which had no Internet access at all - needed high-quality Internet access in order to operate in the modern agricultural economy. National providers had decided that the area was too sparsely populated to justify investment, so the locals decided they needed to act. Can’t get telephone or Internet service? Have you tried starting your own company? In 1998, John Reigle did just that with the support of the community and Michigan State University. Today, Allband Communications Cooperative provides not only telephone service, but also cutting-edge, high-quality Internet access and environmental research opportunities in rural Northeastern Michigan. We connected with Allband representatives who shared details about Allband's interesting and dramatic history as told by Masha Zager back in 2005. They kindly provided updates and let us know what's in store for this by-the-bootstraps effort that started in the woods of Michigan. When John Reigle moved out into the woods past the small town of Curran, Michigan, he didn't intend to start a brand-new venture. He simply wanted to build a home and work on his consulting business; he just needed telephone service. The large incumbent telephone company GTE (which later became Verizon, which still later sold off this service area to Frontier) had assured Reigle that the lot where he planned to build his house would be easy to connect to their telephone network. They quoted him a price of about $34 and scheduled an install date. Trusting that the telephone company’s representatives knew the service area, Reigle moved forward with his plans to build. After he finished constructing his house in 1998, Reigle contacted the telephone company to finalize his service connection. Despite the earlier assurance that his location would not prove a problem, Reigle found that he was miles away from the GTE network. This time, the company quoted $27,000 to run a copper telephone line from the highway to his new house. His consulting firm could not operate without a telephone so he decided to bite the bullet and agree to the steep price. GTE rescinded its quote, however, and no matter how much Reigle offered, the company would not run telephone service to his new house. Bob Hance, President and CEO of Midwest Energy & Communications, formerly known as Midwest Energy Cooperative, spoke to Michigan Radio on the current plans for a high-speed, fiber optic network and the importance of rural connectivity. Midwest Energy & Communications offers speeds of up to 1 Gigabit per second (1,000 Mbps) and has started to expand to new areas in southwest Michigan. Despite concerns that folks might not sign up for Internet service, demand has far exceeded expectations. An industrial park in Niles, Michigan, specifically requested to be connected to the high-speed network. Many of the tenants had considered relocating because of the previously shoddy connectivity. Thanks to Midwest Energy & Communications, those businesses chose to stay put. The co-op now serves about 80 percent of the industrial park with high-speed fiber. For more about the history and structure of the cooperative, check out our own interview with Hance on Community Broadband Bits Podcast Episode 225. This is the transcript for Episode 249 of the Community Broadband Bits podcast. We have a returning guest, Alyssa Clemsen-Roberts of the Pedernales Electric Cooperative in Texas. She provides a first-hand perspective of the decisions and challenges facing electric cooperatives. Listen to this episode here. Alyssa Clemsen-Roberts: I think also as you watch come cooperatives have great successes you'll see others follow. Lisa Gonzalez: This is episode 249 of the Community Broadband Bits podcast from the Institute of Local Self Reliance. I'm Lisa Gonzalez. Alyssa Clemsen-Roberts is Vice President of Communications and Business Services for Pedernales Electric Cooperative. Pedernales serves a large region in Central Texas. In this episode, Christopher gets some honest perspective from someone who can offer unique insight from the world of cooperatives. They discuss a range of issues, including new Legislation from Tennessee, and how it will effect cooperatives. Alyssa and Christopher also get into the challenges that cooperatives must consider, when determining whether or not to offer connectivity to members. You can learn more about Pedernales at pec.coop. Now here is Alyssa Clemsen-Roberts and Christopher talking about cooperatives and the challenges of deciding whether or not to offer connectivity. Christopher Mitchell: Welcome to another edition of the Community Broadband Bits podcast. I'm Chris Mitchell. Today I'm back with Alyssa Clemsen-Roberts, the Vice President of communication and business services for Pedernales Electric Co-op. Welcome back. Alyssa Clemsen-Roberts: Thanks Chris, Thanks for having me. Christopher Mitchell: For people who have been long time listeners, Alyssa has been on the show before, although she was not with Pedernales before. Alyssa you have a lot of experience working with rural utilities and thinking about broadband, tell us a little bit about Pedernales. It's one of the nation's smaller electric co-ops, if I remember correctly.